Tarboro Blues by George Higgs, an acoustic bluesman out of North Carolina, was released by the Music Maker Relief Foundation late last year. This CD shows off the talents of one of the many unrecognized or under recorded musicians that the Music Maker Foundation is dedicated to helping along the way. 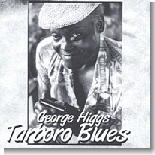 Tarboro Blues shows the musicianship George Higgs has on both the harmonica and guitar, both of which he is equally adept at playing. Most of the songs on this disc are made up of covers, and traditionals, with a pair of songs written by Higgs. "Reuben" kicks off the disc with a very good performance, with George answering his vocals on the harmonica. " I Won't Be Back No More," one of two of his own songs, is a very good piece of country blues, with some good guitar work. Higgs' cover of Blind Boy Fuller's "My Hook's In The Water" is one of the best performances on this disc, with some masterful rolling guitar work and great vocal work. "Going To The River" is a song Higgs co- wrote with his late partner Elester Anderson, telling the story of a man with a cheating lover, pulled off with an impassioned moaning vocal. "Jealous Man Blues" is one of the best performances Higgs pulls off on guitar; it will leave you wondering how somebody like Higgs could have gone unrecorded for such a long time. "Greasy Greens" is an uptempo harmonica workout, taken from Peg Leg Sam; George sticks close to his version while throwing in his own style, a very enjoyable performance. "Black and Tan" is another cover of Blind Boy Fuller that is pulled off masterfully by George, again giving another one of his best performances. The disc ends with a cover of Howling Wolf's "I'm Worried About That," with George on guitar and harmonica, that has the best vocal performance given on this CD. This CD was one of the best released last year, and it should have received more notice. Tarboro Blues can be purchased at www.musicmaker.org, along with the other great releases by the Foundation. Do yourself a favor and check them out. (See my Top Ten list for last year ... Tarboro Blues was #6).